Laura Peña, a visiting attorney with Texas Civil Rights Project, is shown in her office Wednesday, Sept. 19, in Alamo. She is a Harlingen native. “I became a lawyer because I believe in the rule of law and fundamental fairness, not to prosecute babies and send them traveling in planes alone,” the Harlingen native wrote in the June 27 piece, two months after the family separation crisis began at the U.S.-Mexico border. As the Trump administration works to build a physical wall along the nation’s southwest border, it has simultaneously leveraged executive orders and policy adjustments to create an invisible wall. Since U.S. Attorney General Jeff Sessions’ April 6 announcement that anyone who crosses the border illegally will be prosecuted, the government has ruled that people fleeing domestic or gang violence do not qualify for asylum and has urged the end of time limits on detaining migrant children. 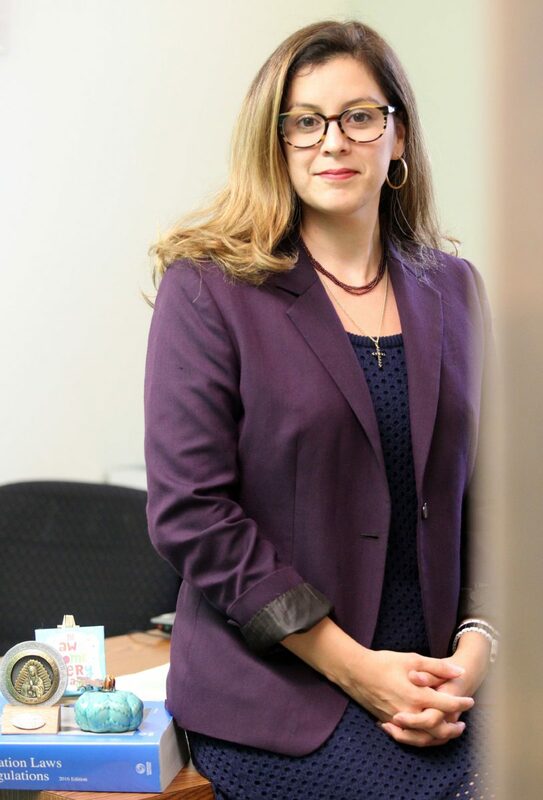 A former assistant chief counsel at U.S. Immigration and Customs Enforcement under the Obama administration, Peña left her job as a business immigration attorney in California in May and has worked as a visiting attorney with the Alamo-based Texas Civil Rights Project since July. She saw a video of TCRP’s Racial and Economic Justice Program Director Efrén Olivares speaking outside the Ursula Border Patrol Processing Center in McAllen and reached out to him about volunteer opportunities. As fate would have it, he received her email two hours after the organization decided it needed to hire a visiting attorney with immigration experience to develop and manage strategies to assist with family reunification. TCRP has provided and coordinated pro bono representation for approximately 400 of the 2,500 families separated after crossing through the Rio Grande Valley in the spring and summer. As of mid-September, about 10 of these families remain separated, held in detention centers in Port Isabel and Willacy County as well as facilities in California and on the East Coast. Nationwide, 500 migrant children remain separated from their parents. Some parents have been deported, while others remain in detention centers because their cases are still being vetted or they have been deemed ineligible to immediately regain custody. She spends much of her day on the phone, taking calls from detained parents, advising the pro bono attorneys TCRP’s staff is working with and requesting information from the federal government. She visits clients at local detention centers and goes to McAllen’s federal courthouse on a weekly basis to interview migrants being prosecuted for illegal entry, screening for any family separations. Despite Trump’s June executive order ending family separations, the zero-tolerance policy is still in effect. Some days, 50 people are prosecuted for illegal entry at the federal courthouses, while other days the number exceeds 100. It didn’t always look like this. Peña joined ICE as a trial attorney in 2014 to learn about the U.S. immigration system from the inside, working in federal courtrooms in Los Angeles and San Diego until March 2016. She came on during the height of the 2014 immigration crisis when a surge of unaccompanied children from Central America attempted to enter the U.S., fleeing countries like El Salvador and Honduras that were ravaged by gang violence. Just a few years before, as a senior advisor at the U.S. Department of State under Secretary Hillary Clinton, Peña worked on citizen security, democracy and human rights issues in Latin America. ICE trial attorneys had considerable prosecutorial discretion under Obama to determine whether or not an individual was a priority for removal. The highest priority group for deportation did not include children and families who entered the country illegally, but rather serious criminal offenders deemed a national security threat. “As an ICE trial attorney, I didn’t believe in winning and losing,” Peña said. “I believed if relief is available then it’s the government’s job to see that the relief is rendered. Peña plans to work at TCRP through the end of the year. The next chapter of her career remains to be seen.